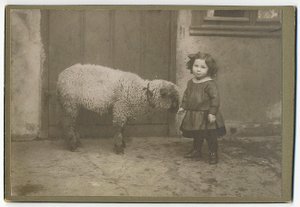 I kept waiting for the other lamb picture to download. Very cute. Her dress is incongruous. It's going to get dirty. so cute. that could be my grandmother! That's a remarkable picture - shows a lot of trust. How sweet! I want to squeeze both of them.